This article has been adapted from Costa Rica: Un laboratorio de mitigaciÃƒÂ³n para el mundo, which appeared in Spanish on Valorando Naturaleza, a sister site to Ecosystem Marketplace focused on Latin America. It was adapted into English by Kelli Barrett and Steve Zwick. Costa Rica’s great experiment with payments for ecosystem services helped restore millions of hectares of forest and shaped the nation into a laboratory for climate mitigation mechanisms. Costa Rica is now establishing a domestic carbon market with plans to link it to international markets in the future-all as part of its plan to become carbon neutral by 2021. 27 January 2014 | The green foliage that characterizes Costa Rica is as famous as the ancient cultures of other Latin American nations. “We have ruins like Guatemala, but we also have a stunning landscape,” says Katiana Murillo of Costa Rica’s Department of Climate Change. And Costa Rica has worked to give an economic value to these natural areas. The world has noticed. Achim Steiner, the Executive Director of UNEP (United Nations Environment Programme), said at the UN climate conference, COP 19, in November that Costa Rica is 10 years ahead of the global community on this issue. Costa Rica arrived at that conference in Warsaw with several proposals they meant to move forward on starting with initiating the first Nationally Appropriate Mitigation Actions (NAMAs) on alternatives to carbon intensive farming. While at the conference, it also looked at establishing a local market for carbon credits. And before the conference, Costa Rica had been working toward recovering forestland lost during the 1980s. A little over 20% of forest was remaining when the government began and now over 50% of the country is covered with green. Costa Rica has captured more than 90 million tons of carbon in recent years, but with no international compliance market to sell credits intoI, it’s using the reductions in-country to encourage a national market for buying and selling carbon credits among businesses, organizations and individuals. By 2021, it hopes to be a carbon-neutral nation. “There’s no doubt that public sentiment in Costa Rica on reducing carbon emissions contributed to the government’s proactive behavior,” says the Director of the Costa Rican NGO, Fundecor, Felipe Carazo. This public sentiment led to the government announcing their goal of becoming carbon neutral and laying out steps needed to fulfill this goal. They made good on one promise by establishing BanC02 in October 2013, an environmental bank focused on climate change mitigation and low carbon development. The bank buys and sells carbon credits allowing people and companies to offset their GHG emissions. The bank is the operational arm of the Board of Carbon-a board that administers the Costa Rican Compensation Unit (UCC), Costa Rica’s carbon credit. It’s also part of the Ministry of Environment and Energy. Carazo still notes the importance of creating national policy that prioritizes conservation and climate change and accounting for it in budgeting and top-level decision making. Because climate change is already being felt in Costa Rica. Between 2005 and 2011, losses from extreme weather events reached $130 million, according to the Ministry of Agriculture. Infrastructure and agriculture were hardest hit. The mitigation schemes undertaken as a result of climate impacts don’t just affect development and farming but also the forestry sector. These sectors are inter-related. “The permanence of the forest is a product of the interrelationships and pressures with other sectors such as agriculture, industry and exports and even those outside of the country,” says Miguel Cifuentes of the Tropical Agricultural Research and Higher Education Center (CATIE) which focuses on environmental issues in tropical America. Out of the range of possible conservation initiatives that could aid Costa Rica in mitigating climate change, Payments for Ecosystem Services (PES) has proven itself as one of the most effective. 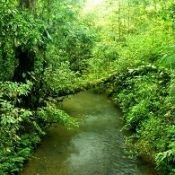 It’s been functioning since 1997 and has developed into schemes like the REDD (reducing emissions from deforestation and degradation) mechanism that preserves tropical forests and encourages biodiversity conservation. Nearly a million hectares of forest has benefitted from Costa Rica’s PES program. Former Minister of Environment, Alvaro Umana, has been promoting PES since the 1980s and largely credits the method for Costa Rica’s recovery of forest cover. He also credits other factors: an expansion of national parks and a law that prohibited changes in usage from forest land. Also, the creation of private forest reserves and tax exemptions for sustainable forest management created incentives for good land stewardship. However, the success didn’t come without challenges. “There are places where this mechanism has had an additional effect and others where it hasn’t,” says Cifuentes. He recommends prioritizing PES in the areas that work as well as pushing for better ecosystem services assessments. Ultimately, PES programs helped reverse Costa Rica’s pattern of deforestation. Conservation measures like the Forest Act in 1996 and the fuel tax came about because of strong public support for conservation. Ecotourism generatessignificant income for the nation, and the people recognize how profitable the forests are. “As a country, we understand that reducing emissions is good for the atmosphere and the climate and also puts Costa Rica on the road to greater global competiveness. Reductions in the cost of production and in our carbon footprint make us more profitable,” says Alpizar. Costa Rica has now moved on to focus on preservation. “The tree should not be altered or used in any form,” says Cifuentes. He is referring to Costa Rica’s stance on cutting down trees for development and how the general population feels about the nation’s deforestation age. This perception is having an effect on the forestry sector. The National Forestry Bureau’s latest report found a decrease by 35% of local wood processing sources and also a 49% decrease in employment since 2007. In order to meet mitigation targets the country is committed to, forests must be strong and standing. But the economy must also be strong. Cifuentes says this is possible. “It’s all in how the resources and land is managed,” he says. Cifuentes considers Costa Rica’s mitigation strategies to be among the best in this region of the world. The belief that concepts like Nationally Appropriate Mitigation Activities (NAMAs) and LCDs (Low Carbon Development) are pieces from the same puzzle is emphasized by the tropical research center, CATIE. CATIE has worked with governments to implement NAMAs in the livestock sector and in the coffee industry. Reaching out to the coffee trade is especially important in a place like Costa Rica because the cultivation of coffee is a part of its history and employs 8% of the country’s workforce. Coffee plantations consume over 90,000 hectares of land, and its production contributes 9% of national GHG emissions. Therefore, mitigation actions have been implemented through the reduction and more efficient use of nitrogen fertilizers. They have also made efficiency improvements in the various stages of processing and have developed programs that support agroforestry systems for carbon sequestration. Reducing emissions from coffee production is essential to Costa Rica’s overall mitigation strategy. Its success will impact other sectors contributing to GHG emissions like other areas of agriculture and energy. Another sector, livestock, accounts for 82% of emissions. Mitigation strategies for this space were deemed impossible on a large scale by a report published in November because of financial, cultural, institutional and technical barriers. The study is uncertain about carbon sequestration and if the problem could really be solved by a NAMA scenario. Cifuentes is quick to point out, however, that there are always uncertainties when dealing with new ideas. The concept of ecosystem services was unheard of 20 years ago. All of these initiatives are meant to achieve the same goal: namely, to reach a national carbon emissions amount of zero. And in 2013, the Voluntary Domestic Carbon Market was established as another initiative to help achieve this goal. The market would operate something like this: companies looking to become carbon neutral or offset a portion of their emissions implement sustainable practices within their operation and purchase carbon credits through BanC02 for unavoidable emissions. Companies and individuals can also sell a surplus of emissions reductions to the bank. The market acts as a forum for participants to trade UCCs-Costa Rica’s carbon credit. The National Forestry Financing Fund approved the appropriation of 1.2 million tons of carbon certificates to secure the future of the PES program. The fund receives a payment through the transaction between a buyer of credits and BanC02. Fernando Orozco, a member of BanC02, says the price of the credits depends on the sector and the parties involved. Clean energy will vary from forest restoration and so on, he says. Any company or institution can become carbon neutral so long as their credits were approved by the Clean Development Mechanism (CDM), Verified Carbon Standard (VCS) or under Costa Rica’s domestic certification. As of this month, eight companies carry the label and four are on their way to get it. BanC02 receives support from several government departments and financial institutions. The Ministry of Agriculture is involved as is the Ministry of Environment and Energy. The National Forestry Financial Fund, National Bank of Costa Rica and the Bank Foundation of Environment-part of the Ministry of Environment- also provide support. The latter is entering into talks over trading in global markets with international organizations and other nations, according to Orozco. Even with this support, the challenges facing PES in Costa Rica is great. BanC02 is responsible for the MRV of mitigation projects ensuring that emissions are actually being reduced. It’s difficult because the methodologies and technical tools needed for this are still very much in development. Costa Rica does need money to finance its mitigation strategies. Ultimately, its plan is to create an international market with credits generated by forest activity. Cifuenetes welcomes this news and the good news that forest restoration is exceeding loss. He’s also pleased that the government is announcing new mitigation tools. But he’s pessimistic about achieving carbon neutrality by 2021. The forest sector is just one sliver of the climate problem, he says. There are other sectors like those mentioned-agriculture, energy-and also transportation. “What can we offer to sectors like transportation so they will reduce their emissions,” he asks. While many questions remained unanswered, one certainty is Costa Rica met with serious success when it set out to decrease deforestation. Forest loss was costing the nation nearly $500 million. With much of the forest recovered, perhaps some of those extra funds could be used toward curbing climate change in other sectors. Milagros Salazar is an investigative journalist for the Inter Press Service news agency specializing in environmental and social issues. She can be reached at milisalazarh@gmail.com.